A new session of art classes for adults and children at Barnsdall Park begins on January 24 and registration day is coming up. Registration for art classes for children at Barnsdall Park Junior Arts Center will be January 8 from 8:45 a.m. to 12:30 p.m. Class offerings include painting, ceramics, and more. 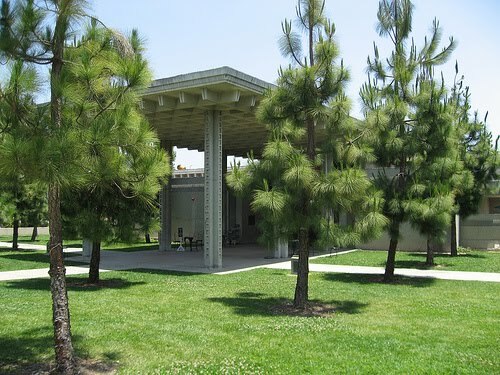 Registration for art classes for adults at Barnsdall Art Park will be January 15 from 8:30 a.m. to 12:30 p.m. Class offerings include ceramics, sculpture, bookmaking, weaving, photography and more. Both facilities are located at 4800 Hollywood Boulevard, which is where the classes and registration will take place. Fees vary depending on the class. For more information, about classes at the Junior Art Center, please call 323-644-6275. For more information about classes at Barnsdall Art Park, please call 323-644-6295. The high winds have led to a number of power outages in the area. The Department of Water and Power (DWP) has crews working across the city to address outages as quickly as possible. If your area experiences a power outage, please report it by calling 1-800-DIAL-DWP. It's possible that the DWP doesn't know that a particular customer (you!) is without power. Operation Pothole 2011 begins on January 8 when the Bureau of Street Services will roll out 50 crews throughout the city as part of an effort to address the increase in street repairs needed because of the recent rainstorms. We need everyone to help make Operation Pothole a success! Please call 3-1-1 (the city's non-emergency service number) to report potholes in your neighborhood. The more potholes we identify, the more potholes we can fix. Please don't assume that the city magically knows about the pothole near your house or on your way to work, school, the store, or wherever. Give us a call at 3-1-1 with the approximate address of the pothole. We want to have as comprehensive a list as possible before the crews are deployed for the Operation Pothole weekend. Next month a series of public hearings, presentations and a public vote will help determine instructional plans, school models and the parent engagement plan for the new Taylor Yards High School in Glassell Park. All events will take place at Irving Middle School (3010 Estara Ave). Hearings and presentations will be held on January 20 and 24 at 6:00 PM in the auditorium. There will be an opportunity for parents, high school students, faculty and staff from nearby schools and community members to cast their advisory recommendation vote on January 29, from 9:00 AM to 3:00 PM, at the Irving Middle School cafeteria. 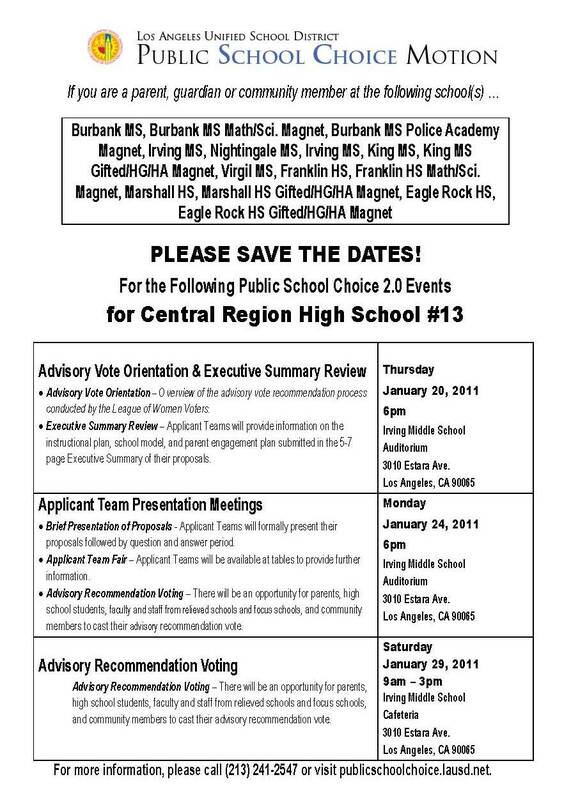 For more information, please call (213) 241-2547 or visit publicschoolchoice.lausd.net. Today we unveiled a new iPhone app that will help drivers in Hollywood find street parking. Hollywood is the first neighborhood in the country to pilot the Parker application, which was developed by Streetline. Parking meters in our pilot area have been outfitted with ultra-low power wireless sensors and sends the data to mobile smart phones through the Parker app. Parker will tell drivers which blocks have more than four available spaces, more than two, or fewer than two. It will also let drivers know where there is "rock star" parking -- areas with the most open spaces. Reducing the amount of time that drivers spend looking for parking will also help reduce traffic congestion, air pollution, and frustration. Parker is available at the Apple app store for $1.99. You can also learn more about it at the city's Department of Transportation website. As with all mobile devices, please do NOT use Parker while you are driving. Find a safe spot to pull over or have a passenger use it for you. Earlier this year, we launched a new iPhone application that allows constituents to report graffiti, potholes, bulky trash items that need to be picked up, abandoned vehicles, and more. Now, Garcetti 3-1-1 (developed by CitySourced) is available for Android and Blackberry users. 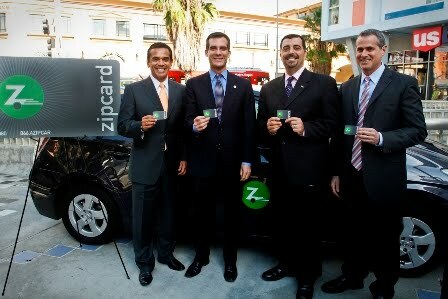 • For iPhone: From the iPhone, go to the iTunes App store and search for Garcetti 311 or input http://itunes.apple.com/us/app/garcetti-311/id360289397?mt=8 directly into the address bar. • For Android: From the Android, go to the Android marketplace and search for "Garcetti311" or input market://search?q=pname:com.citysourced.garcetti311directly into the address bar on the phone (not on the desktop). • For Blackberry Storm: From the device, enter http://content.citysourced.com/downloads/citysourced/blackberry/touch/garcetti311.jad into the address bar or email the address to the device and click on the hyperlink. • From all other Blackberries: From the device, enter http://content.citysourced.com/downloads/citysourced/blackberry/NonTouch/garcetti311.jad into the address bar or email the address to the device and click on the hyperlink. Blackberry users, please note that the app requires OS 5+. Older Blackberries (OC 4.x) cannot run the application. Download the free app today! But please remember not to use the app while driving. 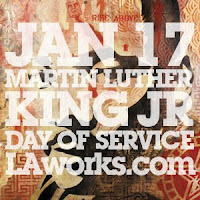 On Monday, January 17, L.A. Works hosts its annual Martin Luther King, Jr. Day of Service. This year, volunteers will beautify and improve Rosemont Avenue Elementary School in Historic Filipinotown by converting an unused area of the library into a reading nook, landscaping to create a literacy garden, and designing a new game room specifically for children to interact with one another. The volunteer project will also include creating murals, painting school buildings, and planting flowers and shrubs. 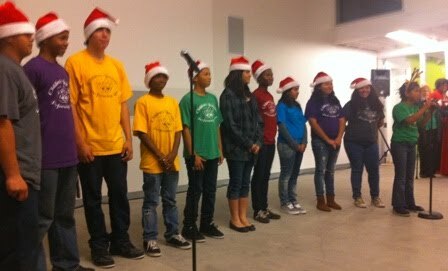 In 2011, L.A. Works will kick off its 20th year of connecting volunteers with volunteer opportunities. The organization manages more than 80 volunteer events each month and has contributed more than 1 million hours of service to Los Angeles. Click here to sign up to volunteer or go here for more information about L.A. Works and other volunteer opportunities. Tomorrow, there will be a flea market in the Dodger Stadium parking lot from 9:00 a.m. to 3:00 p.m. In addition to antiques and collectibles for sale, the market will also feature food trucks and musical entertainment. Please be aware that only the Downtown Gate (adjacent to the 110 south exit/Stadium Way) and the Sunset Gate (Stadium Way /Elysian Park Avenue) will be open for attendees and vendors. For more information, visit PDMarkets.com. On Saturday, January 15, the Glassell Park Improvement Association will be giving away free fruit trees at the Glassell Recreational Center (3650 Verdugo Road). To receive your free tree and mulch or to volunteer at the event, please contact tree giveaway coordinator Alonso at 213-503-7838 or at acalceves@yahoo.com. Today and next Monday through Wednesday, the Central City Action Committee (CCAC) is hosting its annual grand sale. The sale features a variety of used items, including vintage clothes and furniture and all proceeds will help fund local youth initiatives. This event will be open from 10:00 a.m. to 6:00 p.m. at Fire Station Number 6 (534 E. Edgeware). To find out more about CCAC or to find out how you can help, please visit their website at CentralCityAction.com. Hollywood is getting a new transportation option with the arrival of Zipcar. This car sharing program is already available at four local college campuses and is now being tested in Hollywood, a neighborhood that is both walkable and has multiple public transit options. Car sharing programs help reduce air pollution and traffic congestion for everyone. Each Zipcar takes 15 to 20 cars off the road in the cities it serves. Zipcar members pay an annual fee to join and a daily or hourly rate when they want to use one of the fleet's cars. The program gives drivers the flexibility of having access to a car when they need it, but without actually having to own a car. The usage fee includes insurance, gas, and roadside assistance. These locations were selected because of their heavy foot traffic and access to public transportation, including bus lines and Metro stops. Non-Zipcars cannot park in Zipcar spaces, so (as always) please watch the parking signs. This morning I joined the Writers Guild of America West (WGAW) to announce the results of a representation election held yesterday for writers for Comcast Networks - G4, E!, and Style. In a landslide, 46 voted to designate WGAW as their bargaining representative with one vote against the designation. For nearly a century, Hollywood's writers have benefited from a guild that has fought for fair credit, wages, and working conditions, and quality health and pension benefits, and the list continues to grow. Although this election is not binding, I hope it sends a clear message -- these writers (some of whom are pictured above) are serious about organizing, and they want Comcast to sit down with WGAW to negotiate a contract. 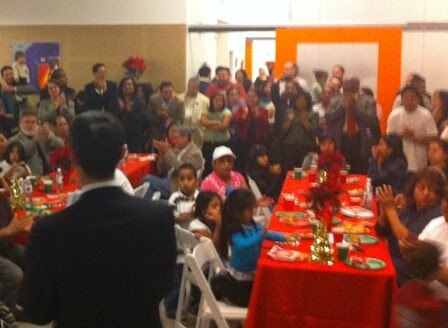 Thank you to the Council District 13 community members who joined us for our annual holiday party last night. We had a great time at the Children's Institute's new Otis Booth Campus -- eating, catching up with friends, listening to a moving performance by young people who have received services from the Children's Institute, and even getting a visit from Santa. Through the generosity of those who attended the festivities, we were able to collect dozens of toys that will be donated to local non-profit organizations that serve families so that they can help brighten the holidays for children in need. Yesterday I helped launch a new campaign to keep production in Los Angeles -- Film Works L.A. Coordinated by the non-profit Film L.A., Film Works L.A. is being supported by a broad coalition of entertainment industry businesses, labor, neighborhood leaders, and others who want to play an active role in ensuring that Los Angeles continues to be the entertainment capital of the world. A significant part of the new Film Works L.A. project is an educational effort to raise awareness of production's importance to our regional economy. According to data from Film L.A., the entertainment industry directly employed 141,000 people in L.A. County in 2008 -- primarily middle class jobs in production, post-production, and distribution. And a study by the Los Angeles Economic Development Corporation concluded that just one one-hour television program generates more than 180 direct jobs and supports 540 indirect jobs as well as generates $2.2 million in state income taxes and $880,000 in state sales taxes. There's no question that these "reel jobs" have real impact on jobs for Angelenos. And these jobs would not be possible without the cooperation of residents and businesses who allow filming to occur in their neighborhoods. So when you see the yellow and black "Film Works L.A." logo in your community, know that the production underway is providing jobs for your friends and neighbors. The City Planning Commission will meet on Thursday, December 16, at 8:30 a.m. at Van Nuys City Hall (14410 Sylvan Street; 2nd Floor) to discuss the 2010 Bicycle Plan draft. 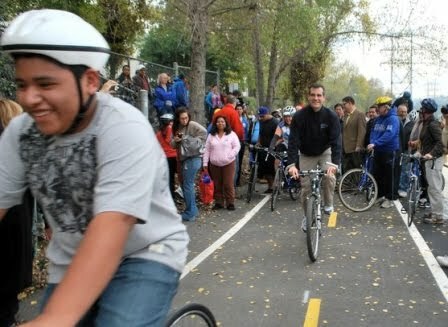 Los Angeles originally adopted a Bicycle Plan in 1996, and updated it in 2002 and 2007. The new draft plan designates 1,633 miles of bikeway facilities and proposes two new bicycle networks. Interested Angelenos are encouraged to attend this public meeting. Copies of the draft bike plan, staff reports, and other related documents are available at www.labikeplan.org. 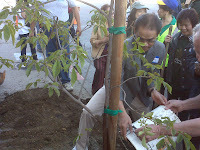 On Saturday, Thai Consul General Damrong Kraikruan (pictured at right) joined more than 100 community leaders in Thai Town to plant dozens of new trees along Hollywood Boulevard. This neighborhood of Hollywood is part of a bustling community that includes Thai businesses and non-profit organizations. The planting, which was part of Mayor Villaraigosa's Million Trees L.A. initiative, will enhance additional beautification projects that the Community Redevelopment Agency and the Thai Community Development Corporation already have underway. Looking for a cute, furry and cuddly addition to your family this holiday season? Look no further -- Found Animals will be conducting their 3rd annual holiday adopt-a-thon event -- Happy Pawlidays -- on Saturday, December 18, at City and County shelter locations, and also Southeast Area Animal Control Authority (SEAACA). All fourteen locations have discounted adoption fees, goodies, and fun in store for the day. The discounts are valid through Christmas Eve in an effort to give new homes to as many pets as possible for the holidays. Pet adoptions will take place from 10 a.m. to 5 p.m.
Get some holiday shopping done while spending the afternoon at the Echo Park Farmers' Market! Tomorrow, come out and support local artisans and farmers, and purchase beautifully crafted gifts for family and friends in a festive atmosphere with live music. The weekly market is held from 3 p.m. to 7 p.m. at Parking Lot #663 on Logan Street, south of Sunset Boulevard. 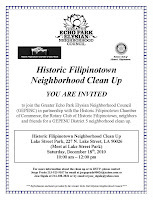 Mark your calendars for the Historic Filipinotown Neighborhood Clean-Up on Saturday, December 18, from 10 a.m. to 12 p.m. 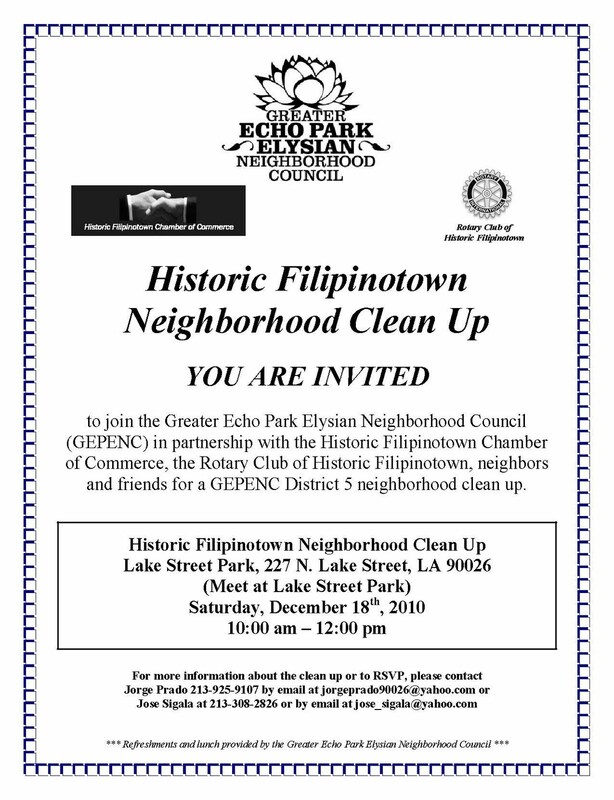 Volunteers are needed to help beautify the neighborhood through this community event sponsored by the Greater Echo Park Elysian Neighborhood Council in partnership with the Historic Filipinotown Chamber of Commerce and the Rotary Club of Historic Filipinotown. 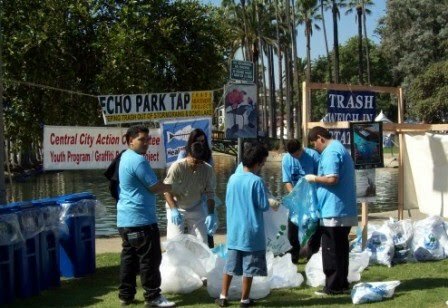 Clean-up participants will gather at Lake Street Park (227 N. Lake Street). 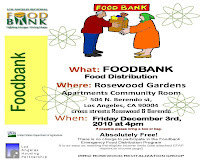 Refreshments and lunch will be provided by the Greater Echo Park Elysian Neighborhood Council. For more information or to RSVP, contact Jorge Prado at 213-925-9107 or Jose Sigala at 213-308-2826. Every year, volunteers for the city's Crisis Response Team (CRT) are dispatched to provide immediate crisis intervention to victims and their families who have been involved in a traumatic incident. Volunteers serve as liaisons between victims and emergency personnel, and give referrals to those affected. If you are interested in volunteering, a seven-week training session will begin Tuesday, January 18, to help develop the skills, knowledge, and relationships needed to serve as an effective CRT member. Training sessions will take place each Tuesday and Thursday evening through March 3 at the Grace E Simons Lodge in Elysian Park. Volunteers must be at least 21 years old and in good physical condition. The program is especially in need of volunteers who are fluent in Spanish or Korean. The program is managed by the Mayor's Office in close coordination with the city's Fire and Police Departments. Residents interested in learning more about volunteering for the Crisis Response Team should contact Jeffrey Zimerman, Crisis Response Team Manager, at 213-978-0697 or via e-mail at LACRT@lacity.org. 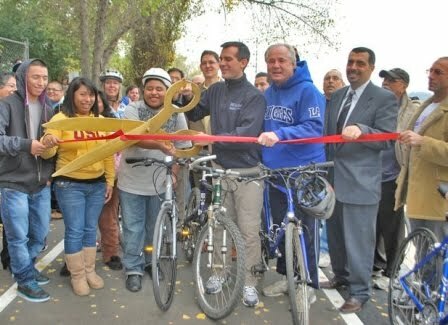 Last weekend I joined the Elysian Valley community in celebrating the opening of a new bike path along the west bank of the Los Angeles River from Fletcher Drive to Barclay Street. For years, community members have walked along this path and efforts to revitalize the river have made it an increasingly popular place for walkers and runners. Now, cyclists will also be able to enjoy the path with a new smooth surface and LED lights. Many thanks to the city agencies that worked to bring this project to completion and to the many community organizations that helped to support this exciting addition to the neighborhood. Bring your bike to Elysian Valley and check it out this weekend! The Hollywood community is invited to visit the Blessed Sacrament School at its Open House on Tuesday, December 7, from 10 a.m. to noon. The school is located at 6641 Sunset Boulevard -- adjacent to the historic Blessed Sacrament Church, which is known for being the home parish of many early Hollywood starts such as Bing Crosby and Ricardo Montalban. Blessed Sacrament recently added a pre-school and serves students through 8th grade. 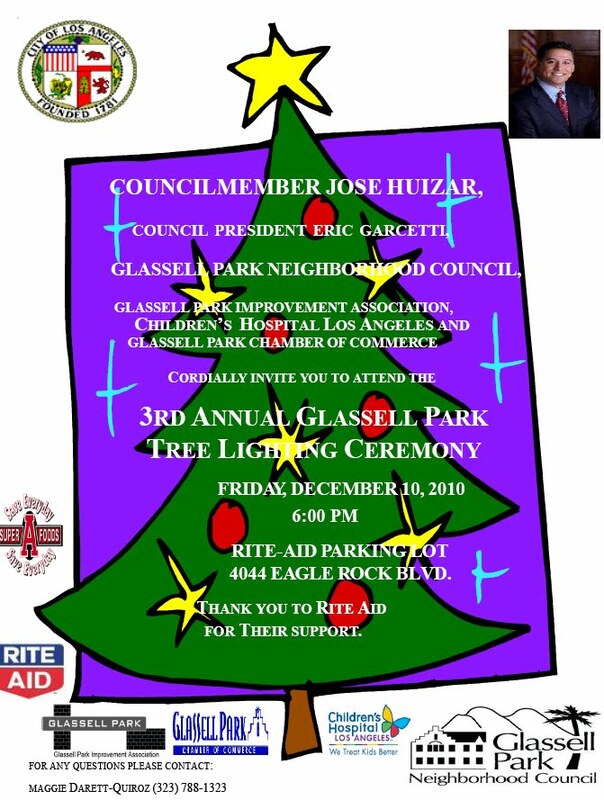 All are invited to join the Glassell Park neighborhood's 3rd Annual Tree Lighting Ceremony this Friday, December 10, at 6 p.m. 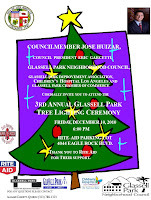 The event will take place in the Rite Aid parking lot at 4404 Eagle Rock Boulevard and is hosted by Council President Garcetti, Councilmember Jose Huizar, the Glassell Park Neighborhood Council, the Glassell Park Improvement Association, Children's Hospital Los Angeles, and the Glassell Park Chamber of Commerce. I will be attending a Hanukkah celebration at Temple Beth Israel of Highland Park and Eagle Rock. The narrative of Hanukkah is focused on the ideas of community resilience, hope and faith amid times of great struggle and change. The holiday stems back to the unlikely victory of the Maccabees in winning back the Holy Temple in Jerusalem, as well as the great miracle of a one-day’s supply of oil burning strong for 8 days. The triumph of the light and resurgence over dark times remains a common theme in Jewish community life and for the congregants of Temple Beth Israel. Temple Beth Israel has been at their present location since 1930 and is one of the oldest congregations in Los Angeles to stay in their original home. Please join me and Susan Goldberg, who will be leading the congregation for this festive occasion. The event will include a dairy potluck, Games for Children and a Hanukkah Sing-a-long, for more information click here! The Los Angeles Housing Partnership will be holding a holiday foodbank on Friday, December 3rd at 4:00 PM, at the Roosewood Gardens Apartments Community Room, located at 504 North Berendo Street in East Hollywood. There is no charge to participate, but attendees are encouraged to bring a box or bag if possible. Coming early is also strongly recommended.